Today we will play for you Smeagol's version of Somewhere Over the Rainbow, from the classic film The Wizard of Oz. Smeagol likes the movie, but not the nasty wizard. We doesn't like nasty wizardses. 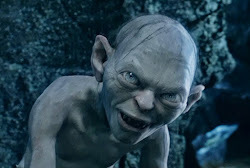 They wants to lock us up and ask us questions Smeagol doesn't want to answer. But Dorothy is nice. We thinks she would be nice to us. So we sings her song as we dreams along with nice Dorothy.